The Glen of Imaal Terrier is a dog that is big in spirit for being such a small creature. They are very curious canines and adore playing as well as hunting. While they still bode that same energetic spirit that the other variations of Terriers do, they are calmer by nature than the majority of Terriers. They are the type of dog that enjoys a day full of play and an evening inside. Mild tempered and caring dogs they are easily amused and happy when they are engaging with little ones. Some, but not all can tend to be somewhat aggressive creatures, but generally with good reason. Not very big on barking, but they can be stubborn at times. Very playful, equally as affectionate and friendly with most people and other pets they come across in their daily interactions. The great qualities about the Glen of Imaal Terrier breed are that they are a travel size dog, meaning they can easily be transported anywhere on a road trip and even on a shopping trip. They can also be active enough in engage in any physical games as well. This type of Terrier is adaptable in virtually any temperature or climate without very much maintenance. They are also such curious creatures that you will need to keep a close eye on them when walking or jogging on a street or a trail even while on a leash as they tend to pull away and chase at times. It is not advised to permit them to play in the water, especially shallow waters until you have them trained comfortably in water as they are usually not well versed in the water. Grooming them is a cinch, with regular brushing as any canine would require, but they will also need stripping on a quarterly basis as well. The Glen of Imaal Terrier is not a dog that runs into many health concerns which is why they are such popular family pets. They can run into developing PRA and on rare occasions they can also obtain CHD, both are very common in all dogs. The vet may recommend testing as they age for their eyesight as well as for their hips. The average lifespan for a Glen of Imaal Terrier is from ten to fourteen years long. Generally they weigh from thirty to thirty five pounds as full grown dogs. 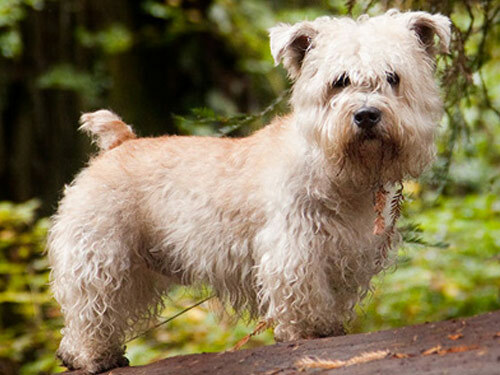 The Glen of Imaal Terrier derived from the Glen area of Ireland, where they became a special and valued Terrier just for the residents of the Glen area. They gained a reputation for hunting rats, badgers and foxes also. They also were a favorite among those who enjoyed and attended dog fights during that time as the Glen of Imaal Terrier was quite the little scraper for their size. Also known for their vermin hunting and their image as a farm dog, they quickly developed an image for being a great companion dog. They were not popular for breeding in the United States until the later part of the 19th century, they did obtain a place as the AKC recognized group of Glen of Imaal Terrier Club.